CM-BIM candidates must attend all four AGC BIM Education Program coursesApplications will not be processed if all units have not been completed by the application date. Once CM-BIM candidates complete the four mandatory courses, they are eligible to register for the exam by filling out the online CM-BIM Exam application. All exam fees total $575.00 and will be collected at one time after the candidate application is reviewed and approved. If an individual does not pass the exam on the first attempt, the candidate may re-apply to take the exam by submitting the online exam retake form. The retake fee is $100. An optional CM-BIM Exam Prep Course is available for purchase here to support your review and study for the exam. This two-hour self-paced e-learning course reviews the process of Building Information Modeling, BIM, as taught in AGC's BIM Education Program. The course is designed to supplement learner's review and study of the curriculum's four units as they prepare for the CM-BIM exam. The cost of this prep course is $79 for members and $99 for nonmembers. A listing of CM-BIM holders can be found here. Have you earned your CM-BIM but are not listed? 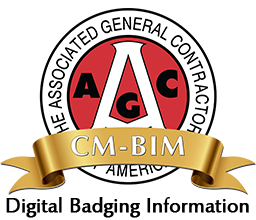 Email cm-bim@agc.org (link sends e-mail) to allow us to share your accomplishment. The CM-BIM was designed to demonstrate knowledge and understanding of concepts related to BIM adoption, practice, and process. Because BIM is always evolving, individuals need to keep current with these advancements and continue their learning through continuing education. Once a candidate earns his/her credential, it is valid for an initial period of three years before it needs to be renewed. To learn more about the CM-BIM renewal process, review the CM-BIM Renewal Requiremnets.